Bollywood celebrities are no new to social media trolls. Not just common people, even celebrities have to face cyberbullying. From Priyanka Chopra to Deepika Padukone, many B-town biggies have been trolled horribly. The recent addition to the list is none other than Padmavati actor Ranveer Singh. The actor has been trolled mercilessly over his new picture caption that he share on twitter. Readers were quick enough to judge the actor. 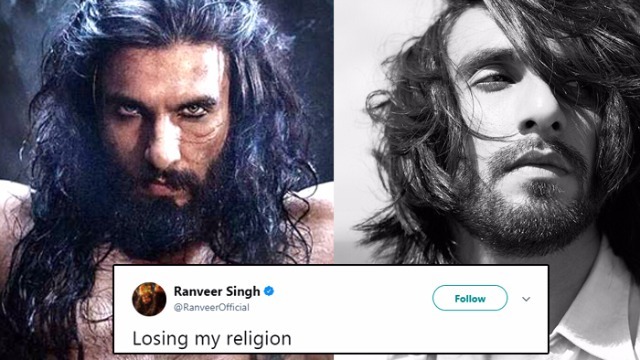 Ranveer was trolled for his picture caption that read, “Losing My Religion”. Without knowing the true meaning of the caption, the actor was trolled horribly. In the true meaning the picture caption, “Losing My Religion” is an iconic song by American rock-band REM. Actors are not only acting in reel life but in real life as well. Why don't you convert your religion and prove it before making all these controversial statements? Garnering cheap publicity for his upcoming film. This things will lead to disastrous results to your movies. Remember, your's existence is from people of India. Don't try to act foolish. May be this movie would work for you but next will fail as India never forgives. Tum Jaise Logo ki Wajah se Bharat 2000 Saal Tak Gualam Raha , Jo Paise ke liye Apni Maa Behan aur Desh Ko Bech Dete Hai . Dictators ne isi Wajah se is desh ko Gulam banakar rakah , Tum Log Us time ke Jai Singh ho. It's not the hate. It's the ego of him which has been transferred him to post such tweets. If you both are from his PR team then do convey him my message that keep the things straight and simple. Address the concern of community and fix it to go ahead with the film. आप तो एक कदम आगे है ?? इस देश मे दोगलो की कोई कमी नहीं है और इन सब दोगलो को अपने ही हिन्दू होने पर तकलीफ होती है ऐसा कयू ?